Android comes loaded on a number of mobile devices and can be used to work on documents. Usually, once a document or image has been worked on and is ready to be printed, you might need to transfer the document to a computer using a data transfer cable. In an office scenario, the IT policy may not allow flash drives. Transferring files then might be an issue, especially if all that is required is a simple printout. In this article, we’ll look at two methods to print directly from your Android device. Fortunately, the Google family of products has a solution for this issue. It comes in the form of Google Cloud Print. The basic idea is that if your computer or printer is Cloud Print enabled, you will be able to use the printer via your internet connection. First, you need to download the Cloud Print app from the Google Play store on to your Android device. Then, make sure that Chrome is installed on the computer that your printer is connected to. Set up Cloud Print on the computer by clicking on the wrench icon, Settings and enable Cloud Printing. Sign in to Chrome using the same account that you use on your Android device. Now, all you need to do is choose Print and choose the printer that you want your printout from. Epson, Kodak and HP have come out with Cloud Print ready printers. These printers have wireless access to the Internet and can be used for print jobs even if the computer is connected to is not switched on. The Cloud Print app offers printing support for the following file extensions-pdf, jpg, jpeg, docx, ods, xls, xlsx, ppt, odp, txt, doc and xps. 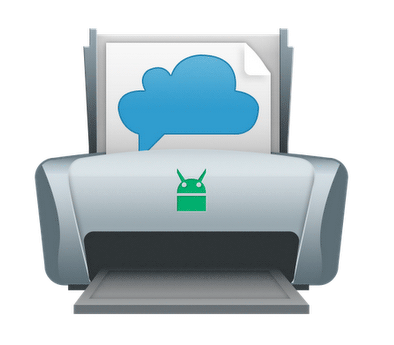 Another option that you can use to print from your Android device, especially if you are wary about sending your file to the Cloud is PrinterShare or PrintBot. These are paid apps ($12.99 and $4.99 respectively) that allow you to print from all the printers connected to your network without sending the files to the Cloud. There is a reason you should spend money for this kind of an app even though you use Cloud Print. It lets you print on other people’s printers when your device is connected to their network. This app has the ability to locate nearby printers whether they are wired or wireless as long as they are connected to the network. This app also allows you to print to Cloud Print. It is compatible with most types of printers, even the older ones. If your printer is Wi-Fi enabled, then it doesn’t even need to be connected to a computer. In case you have an advanced printer that cannot be used to print from your Android device in spite of trying Cloud Print and Printer Share, try going to Google Play to download an OEM app. Most printer companies have branded apps for free in the app store. These may help you to print, though usually they work best for a limited range of document types.